WebGoonies.com - Professional Fort Making. Written on June 10, 2008 by Kevin. When you need to make a fort for the kids that is not just going to fall over when one of them stands up, you need to bring out the big guns. 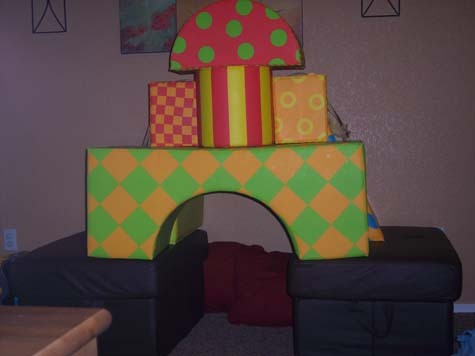 I threw this mini fort together the other day and it has managed to stay up even with both kids playing inside of it. Rylan likes to lounge back there and watch his favorite movie of the day. Kaitlyn loves to crawl in and then pop out as we yell "Peak-a-boo!". They show no signs of wanting it down despite Rylan stopping me from making it a few weeks ago as he wanted to make his own "fort". He is an amateur though and his design failed shortly after. In time he will learn the art.